« Lizards learn from their elders too! Trial and error is a fundamental form of problem solving, and as such a great deal of humanity’s knowledge has been derived using such methods. As you can likely gather from the name, a key component of this heuristic method of learning involves the act of making mistakes. Mistakes that allow us to evaluate what happen and alter our actions to try again. Making blunders is a part of normal life for your average day to day person. To err is human. However there is a certain short list of great thinkers whose brilliant successes elevated our perception of them to be often infallible. Why, even the name Einstein is now synonymous with intelligence. That being said these people, were just that, people. When pricked they did bleed. And while pondering (often topics at the time imponderable) they did make mistakes. 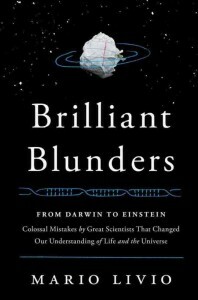 Mario Livio’s book ‘Brilliant Blunders’ is a relentlessly researched examination of five of the world best thinkers and some of their greatest mistakes Not to be confused with a collection of zany science anecdotes; such as when Copernicus lost his keys or Sir Isaac Newton accidentally put salt in his coffee. No, this well thought out story examines Charles Darwin, Lord Kevin, Linus Pauling, Fred Hoyle, and Albert Einstein’s greatest successes followed by a spectacular blunder. From an Nobel prize winner in Chemistry hastily proposing a theory which ignored basic rules of bonding (as would have been taught in Chem 101), to a framed astrophysicist giving name to the “Big Bang” while passionately attempting to disprove it, it seems we ALL make some silly mistakes. However in making these blunders these five great minds may have paved the way for more discoveries to be made (often by the masses of people trying to disprove them). It seems there may still be a silver lining to a science rock star getting the proverbial egg all over his face. This is the type of book you need to read twice. Once to get the gist, and once again to take notes. It is a great read and the wonderful tour into some the most brilliant blunders of modern science.